Sagamore Farm Archives - Blackburn Architects, P.C. : Blackburn Architects, P.C. 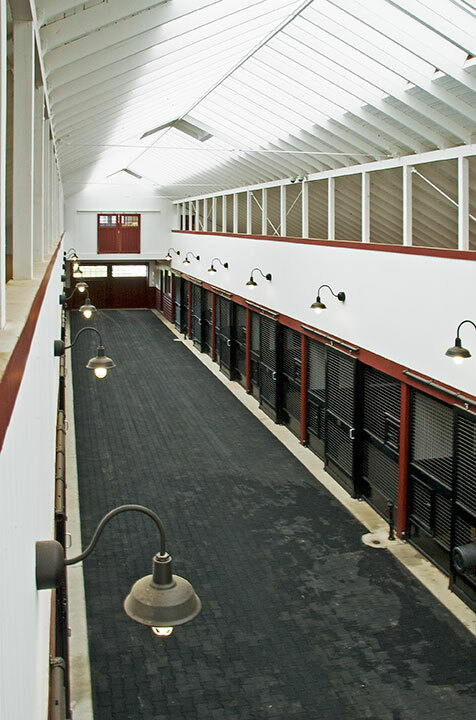 With careful attention to design details, it is possible to retrofit your barn to be healthier for your horses. One important renovation to existing built structures is the addition of skylights and ridge vents to increase light and air flow. Only a fortunate few horse owners design and build a barn from the ground up. Most buy a property with an existing barn. 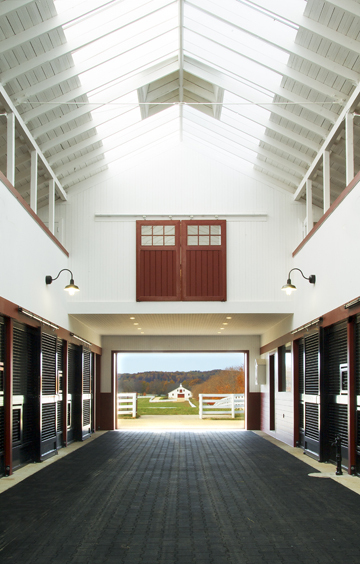 As the photos illustrate, Blackburn Architects’ client Kevin Plank, the CEO of Under Armour®, bought historic Sagamore Farm in Maryland, and undertook a significant renovation to add light and ventilation to the interior of his historic main barn. Significant expenditures are not necessary, however. In this discussion, I’m offering simple recommendations for achieving healthier living space for horses starting with an existing barn. 2) Add a vent along the bottom edge of the skylight (or ridge if that works best though I prefer the curb vent for better free air access). This option provides good access for ventilation to each stall and a great method of controlling air flow. An owner has the option of leaving just the upper door open to reduce the flow or open both upper and lower doors to give maximum free area. (Of course, in order to open both doors for full access you’ll need to add an interior mesh panel to keep horse in the stall.) If Dutch doors aren’t possible or within the budget, then I recommend adding low wall vents to bring in air low to the floor (which is good for foals and to vent odors caused by ammonia gases near the floor). The vents should be dampered for air control and screened to keep rodents from getting into stalls. 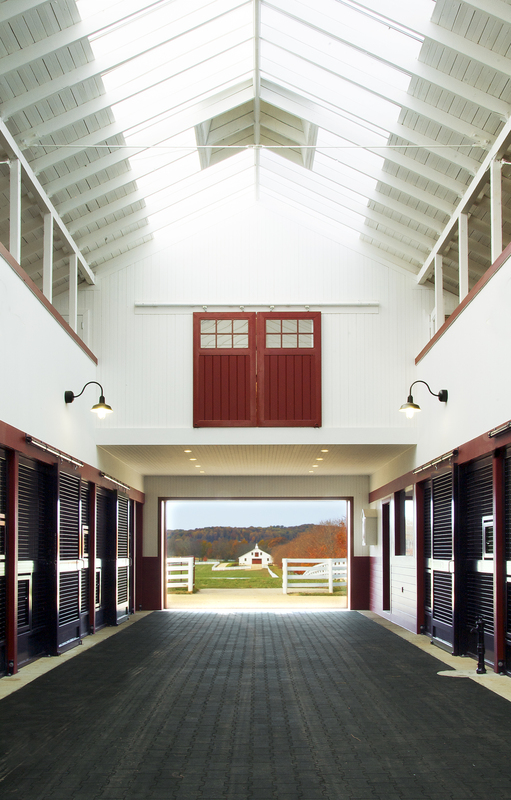 Additionally, Dutch doors provide an abundance of natural light, which reduces the need for electric lighting in the barn and helps purify the stall flooring, reducing the creation of harmful ammonia gases. This option allows for vertical ventilation of the barn using the Bernoulli Principle and the chimney effect. Though the existing barn may not have the best angle for prevailing breezes or roof slope, it will help nevertheless. I also recommend vents at the top of the wall at the roof eave if they can be added. 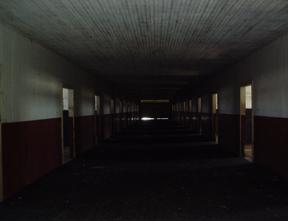 This permits year-round ventilation above the heads of the horses, but still ventilates the barn vertically using the techniques described above. There are a variety of methods and materials that can be used to retrofit skylights into an existing roof. At Sagamore Farm, Blackburn Architects’ design replaced the existing shingles with a new metal roof (not necessary; Sagamore’s roof shingles were worn out and metal was chosen as a better long term material). In more typical circumstances where the existing shingles are salvageable, simply remove the shingles along the ridge and cut out the sheathing or sub roofing material, leaving only the roof rafters. Continuous curbs should be built along the edge of the opening. Although a continuous skylight or curb is not necessary, I find it aesthetically and functionally preferable. A skylight can then be placed on top of the curbs spanning from one side of the aisle to the other. The curb can and should be vented. The size and amount of free area depends on the barn design, size and location. The skylight width does not have to span the full width of the aisle but somewhere between 8 to 12 feet should be adequate. The skylight can be either glass (costly and should be safety glass) or some form of polycarbonate. Check your local building codes for requirements. I do not recommend clear glazing. Translucent glazing reduces the visibility of dirt and filters light, which better serves the barn interior. It’s best not to let a strong band of sunlight hit a stalled horse for a long period of time. I also recommend painting the interior of the roof and framing members a light color to improve reflectance. If a continuous skylight is not possible, then individual roof skylights can be installed over the center aisle. However, if the skylights are not high on the roof and are not vented, they may not do much to increase the barn’s vertical ventilation. If the barn has a loft it may be possible to remove it, leaving specific structural members spanning across the barn to hold the building together and to provide wind shear strength to the barn. If the loft is used for hay storage (which I don’t recommended for health and safety reasons), then it may be possible to remove a portion of the loft over the aisle leaving the loft in place over the stall for storage or the reverse of that (remove the loft over the stall but leave it in place over the aisle). While these approaches to increasing light and ventilation in existing structures can work wonders, you should always contact a structural engineer before installation of skylights to determine if the barn can take the modifications needed of if some additional structural work needs to be done. Beth Herman’s article about the renovations at Sagamore Farm is published in today’s DCmud. I get a huge smile on my face just thinking about Sagamore and hope you do too after reading the story. The farm is a Maryland landmark and I am grateful that Blackburn has been trusted to contribute to the farm’s storied history. Blackburn Architects is so grateful to be a part of Kevin Plank’s dream to revitalize the horse racing industry in Maryland through his work at Sagamore Farm in Glyndon. We hope you’ll enjoy these articles from The Washington Post and The New York Times about Mr. Plank’s impressive ambitions for the historic farm and to elevate Maryland’s racing industry clout. We believe that if anyone can do it, it’s Mr. Plank. Congratulations to the whole team at Sagamore Farm, whose All Mettle won Pimlico’s $30,000 maiden special weight race in only her second career start! Congrats to Sagamore Farm and Shared Account! Zenyatta may have gotten most of the press, but my eyes were on Shared Account at the 2010 Breeders’ Cup. I didn’t have the pleasure of attending this year’s event, but I was thrilled to watch (thanks to ABC and, later, YouTube) Shared Account’s win of the $2 Million Emirates Airline Filly & Mare Turf at Churchill Downs. It was only three years ago that Kevin Plank, owner and CEO of UnderArmour, purchased the historic Sagamore Farm in Glyndon, Md. with the intent to revitalize the racing industry in Maryland. As Blackburn Architects headed the architectural renovations that took place at Sagamore, I can only hope that Shared Account and her fellow horses are safe and comfortable in their stables in between races. With the hardworking and talented staff at Sagamore, I’m not surprised in the least that the great ambitions of Kevin Plank are quickly coming true before their eyes (and the eyes of thousands of spectators at the Breeder’s Cup!). Congratulations to Shared Account, her trainer Graham Motion, and everyone at Sagamore Farm. I look forward to watching your continued success in the years to come. 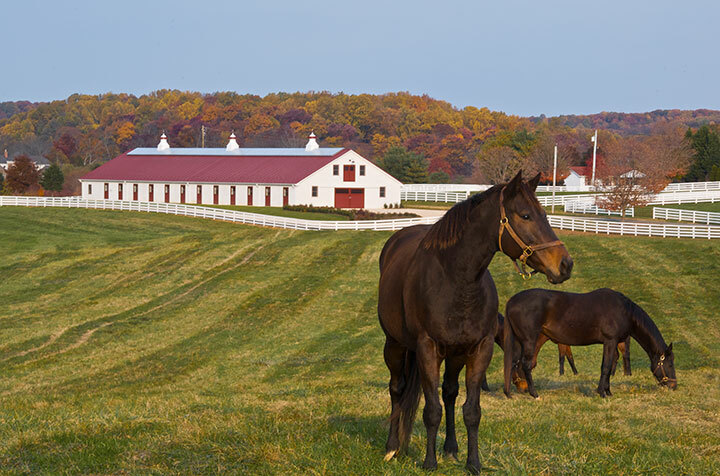 Grazing horses at Sagamore Farm in Glyndon, Md. We’re really excited to be a part of Kathryn Masson’s new book called Stables: Beautiful Paddocks, Horse Barns, and Tack Rooms. The book features stunning photographs by Paul Rocheleau and showcases a variety of stables across the United States. One of the stables shown is Sagamore Farm, the famous thoroughbred-horse breeding farm originally owned and operated by Alfred G. Vanderbilt, II. Blackburn Architects had the pleasure of working with Sagamore’s current owner, Kevin Plank, CEO of Under Armour, to restore and upgrade the facilities, which had fallen into serious disrepair from the former previous ownership. 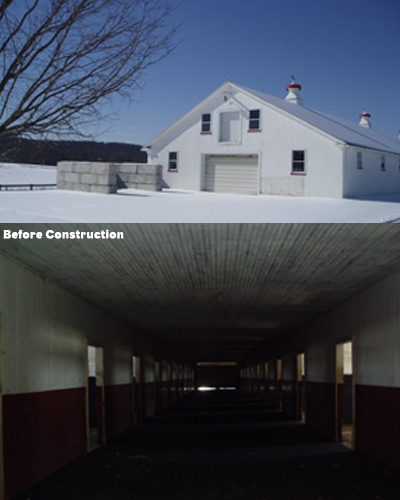 We provided architectural services to renovate two of the farm’s existing barns: the 16-stall foaling and 20-stall broodmare barns. If you’d like to check out the book, it’s available through Amazon and Rizzoli. The Classicist blog has also written about the book in a post titled America’s Finest Equestrian Architecture.